TOMS RIVER – Two Ocean County Library branches will host a presentation by Jackson family physician Susan Rodriguez-Bostock, MD about memory loss and dementia Tuesday Nov. 18. The program will be followed by a confidential five to 10 minute individual memory screening. Stafford branch, 129 N. Main St., Manahawkin, 609-597-3381 at 9:30 a.m.
Manchester branch, 21 Colonial Dr., 732-657-7600 at 1:30 p.m. The programs are free but registration is required. Telephone the branch to register. The programs, held in recognition of National Memory Screening Day and part of the library’s Chapters of Health series, are sponsored by Meridian Health in partnership with the Alzheimer’s Foundation of America. MANAHAWKIN – Barbara Gruning, a WWII air evacuation nurse, will talk about her battle experiences and book, “Flight Nurse: From Pearl to Tokyo” 6:30 p.m. Monday Nov. 3 at the Stafford library branch, 129 N. Main St.
Gruning joined the Army Air Corps in September 1943 and went on to train in a newly developed program to become a flight nurse. 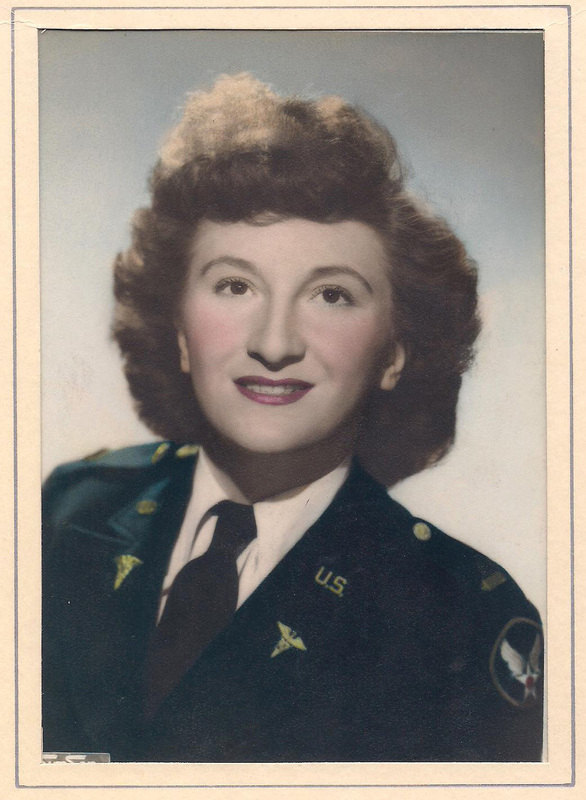 After her training she flew nearly 300 hours during a period of eight months, caring for wounded soldiers who were being flown to base hospitals all over America. In December 1944 she volunteered for overseas duty and was based at Hickam Field in Oahu which was bombed by the Japanese when they attacked Pearl Harbor on December 7, 1941. She flew over 600 hours more, bringing back the severely wounded from all over the Pacific Ocean to Hickam for treatment and transfer to other stateside military hospitals. The Japanese surrendered on August 14, 1945 and officially signed the document of surrender on September 2nd. Her final mission just twelve days later was to fly into Tokyo and return to Guam with a plane full of American prisoners of war. She left the Army as a 2nd Lieutenant and returned to civilian life. After returning to the States she settled in Philadelphia and married. She and her husband had one daughter and they moved to rural South Jersey where she worked for several years as a hospital nurse. She then went on to spend 25 years as an industrial nurse for a large chemical company. This program is free and open to the public. Please register by calling the branch at (609) 597-3381, registering online at www.theoceancountylibrary.org or in person. MANAHAWKIN – Mark Allen, a former Marine fighter pilot and celestial navigator on air-refueling tanker planes, will present “What Happened To Amelia Earhart” at Ocean County Library’s Stafford branch, 129 N. Main St., Manahawkin 10:30 a.m. Thursday November 6. Allen, a member of The International Group for Historic Aircraft Recovery (TIGHAR), believes that Earhart and her navigator Fred Noonan, landed on a tiny uninhabited island now known as Nikumaroro in the South Pacific’s Phoenix islands. Because of evidence that he credits to TIGHAR, he believes the mystery surrounding Earhart has been solved and he will present this evidence to us. This program is sponsored by the Friends of the Stafford Library. MANAHAWKIN – The Stafford branch of the Ocean County Library, 129 N. Main St., Manahawkin, will host String of Purls – Knit/Crochet Group Saturdays, Nov. 1st and 15th from 10:30 a.m. – 12:30 p.m. and Thursday Nov. 6th from 1 p.m. – 3 p.m. Whether you’re just learning to knit, crochet, embroider, etc., already know how or want to know what a “purl” is, join our group where experts will be available to answer your questions. Find that creative streak you know you have with this craft that has recently enjoyed an explosion of interest. For beginners, bring size 10 knitting needles and light-colored 4-ply worsted yarn. To crochet, bring the same type of yarn, and a size “I” crochet hook. If you’re more advanced, bring the project you’re working on. This is an excellent way to exchange ideas. This program is free and open to the public. There is no need to register. If you have questions, call the branch at (609) 597-3381, or visit our website at www.theoceancountylibrary.org . 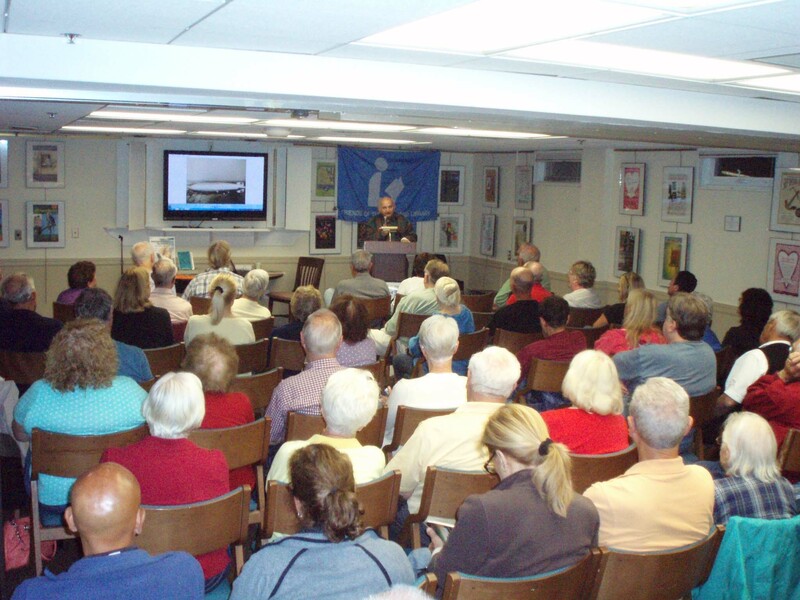 Sixty-four people attended a program by Carl Jablonski, president of the Navy Lakehurst Historical Society, at the Stafford branch Wednesday, Sept. 17th. The German dirigible Hindenburg caught fire as it was mooring at Lakehurst May , 1937, claiming the lives of 35 of the 97 men and women on board plus one member of the ground crew. The disaster ended commercial passenger service in rigid, lighter-than-air crafts. Jablonski displayed artifacts from the disaster. The program was sponsored by the Friends of the Stafford Library. Warren Schein sang songs made popular by Mel Torme during a performance at the Stafford branch. The classic sound of Mel Torme was heard during a program held on Aug. 28 at the Stafford Branch. The audience was quite receptive to the program called “Warren Schein Sings Mel Torme Songs.” Warren proved to be a polished performer in both his singing and stand-up comedy. Frank Sanchez who accompanied him on piano was also excellent and the two of them worked very well together. 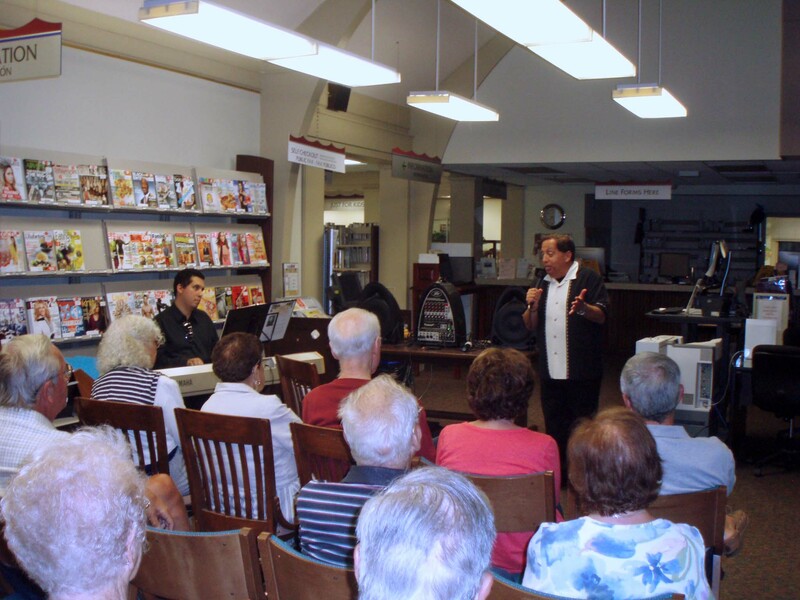 Members of The Oceanaires performed at the Stafford branch. The Oceanaires Barbershop Quartet performed at the Stafford Branch of the Ocean County Library on the evening of Aug. 26. The group is celebrating their 56th year of performing this year. They brought their special brand of singing to large crowds at OCL’s Upper Shores and Jackson locations earlier this summer and drew an audience of 43 people in Stafford. The 23 Oceanaires members sang such favorites as “My Coney Island Baby”, the theme from “Cabaret”, “Under the Boardwalk”, and many others during the night. During performance breaks they explained a bit of the history of barbershop singing and how it has evolved through the years. Members lamented that interest has dropped over the decades and many chapters have disappeared. The Oceanaires, which is the local chapter of the Barbershop Harmony Society, will perform next at 7:30 p.m. on Monday, Sept. 29 at the Long Beach Island Branch. To register for this program call 609-494-2480.